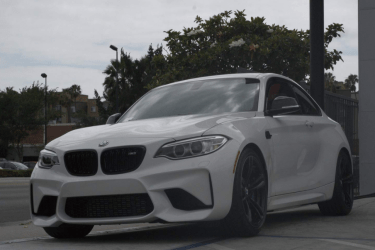 The BMW M2 is fully equipped with the highest technology and performance benefits on the inside, but it’s what’s on the outside that needs adequate protection. While it is practically invisible, this car has an extra film layer on the front end to keep the Alpine White coat looking brand new. 3M’s Paint Protection Film is the perfect way to prevent scratches and other debris from impacting the vehicle’s paint. If you’ve been debating whether or not to get a clear bra on your car, just think about the benefits moving forward. High performance urethane film protects vulnerable, painted areas of the vehicle from scratches, chips and stains. The protective film does not alter the color or design elements of vehicle. Armed with self-healing technology that delivers unrivaled scratch resistance. Has optimal clarity while maintaining the original surface appearance. Supplies tough, durable and maintenance-free performance. Top Gear calls the M2 “a pure and simple BMW driver’s car: no fuss, no mess, no all-wheel-drive or off-piste body style.” We’ve heard nothing but good feedback on how the car looks and feels, especially when driving through streets or canyons. At Innovative Auto Craft we offer clients the latest in automotive vinyl products from the leading manufactures such as 3M and Avery Supreme. We like to provide the upmost quality in our wraps as we clean, prep, and de-trim each vehicle to ensure a flawless final product. If you’re looking to protect your vehicle from road and track debris, we also offer 3M’s self-healing paint protection film. Call or visit us today to get it installed and avoid potential damage in the future.